Noun/Verb pairs are signs that use the same handshape, location, and orientation, but have a different movement. The verb of a noun verb pair generally has a single, continuous movement that is larger than the movement of the noun. The motion of a noun of a noun verb pair is generally a double movement that is smaller than that of a verb. Verbs (of noun/verb pairs) use a single movement. Nouns (of noun/verb pairs) use a double movement. A good example of a noun verb pair is the "CHAIR/SIT." If I do this motion once, it means sit. If I do the movement twice, it means CHAIR. But sometimes if I'm in a hurry I'll only do the movement once and my friends still understand me. Why? Because of context. The rest of the sentence makes the meaning clear for me. For more on this topic, see: "Compounds"
My question is in regard to double motions for signs. I read on your site that for a sign that can serve as both a noun and a verb, usually a double motion represents the noun and a single motion represents the verb. I also read that a double motion can be used to represent an ongoing action (like learn“-ing”). So for a noun/verb sign like sit/chair and others, is it only context that will give the distinction between “chair” and “sitting” if the signer makes a double motion? If a sign is generally considered a (noun/verb)-pair sign – that means people in the Deaf community “conventionally” use a double movement to indicate a noun and a single movement to indicate a verb for THAT sign. Thus it is “convention” (not “context”) that determines whether or not the double motion of a (noun/verb)-pair is a noun. I can sign “CHAIR” totally out of context and other Deaf will understand what I mean. 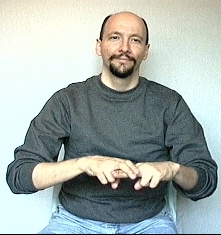 I can sign “SIT” totally out of context and other Deaf will usually assume correctly what I mean. I can sign SIT in the context of other signs such as “MY SIT GONE!” (My chair is gone!) and other Deaf will generally infer that I actually meant a noun. It is good to remember that the (noun/verb)-pair “rule” only applies to (noun/verb)-pairs. I know that seems like an “obvious” statement but my point is that (noun/verb)-pair rules don’t apply to non-(noun/verb)-pairs. Suppose a verb doesn’t have a noun to which it is paired? You have a verb for which a double movement doesn’t create a noun. For example, the verb “drop.” (In this instance I’m discussing the activity of dropping something and I’m not talking about a “small unit of liquid.”) Signing “DROP” twice doesn’t create a noun. Signing DROP twice creates a process. (I kept dropping it.) If I want to create a noun out of “drop” I can precede the sign DROP with the adjective “THAT.” For example, if a student recently dropped a course and I want to inform the student it was “that drop” which caused him/her to become ineligible for a scholarship.